Title column is very important default column in SharePoint libraries. During saving documents to libraries, sharepoint doesn’t require data input in title column. Content written in this column can be optimizing search and can be used in various scenario internal in SharePoint. As default, when user start word from SharePoint in Document Information Panel we see the title field if the DIP is visible. In some cases where the content type doesn’t show DIP user need to put the file name when they save document back to SharePoint. In this process SharePoint doesn’t add any title in title filed. That process, user must do for every saved document in SharePoint. If having title filed optional and show DIP always (from CT settings) will not work properly because users often forget to write anything in the title filed. To set require for title field, will show DIP where user have to put anything inside the title field. That creates more headaches for users. But why not create a Workflow which adds title based on file name? In this blog I will show how to create a workflow which adds file name in title field. So I am opening my site in SharePoint Designer 2010. Writing a statement that if title in blank adds filename to title or may be opposite add same input in title to file name for the document. Creating the statement and testing before publishing. Don’t forget to choose to start workflow when you create new items in library. Adding a document with filename Rizwan. When the workflow in completed the title is as same as filename. Everything is done automatically. 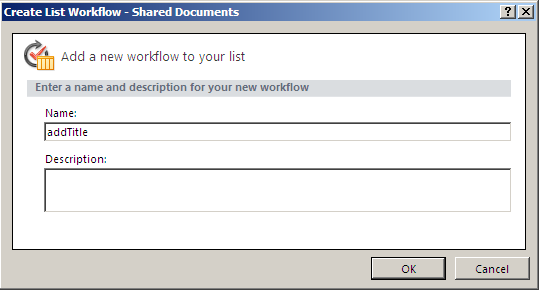 This entry was posted in SharePoint 2010, SharePoint Designer 2010 and tagged workflow by Rizwan. Bookmark the permalink.